One main missing feature of Duplicati is the possibility to monitor multiple Duplicati instances in a central place. Moreover, Duplicati can only send one email after each backup run, but cannot send summarized backup information. https://www.duplicati-monitoring.com fills this gap: It provides you a beautiful dashboard to monitor all your backups, and it sends you beautiful email reports that summarize your backup results. It is a hosted service that is free of charge. If you like it and want to keep us going, then we’d appreciate a small donation. You can use this thread to provide feedback, ask for new features or report problems. I am planning to also use it to provide some news update the service. Is a server/client setup possible with Duplicati? If our service makes your life easier, please consider donating. Your donation is needed to pay for our developing costs and hosting expenses. Thank you. Looks like a great donation-worthy service. Which reminds me, I need to make a duplicatie-donation still. 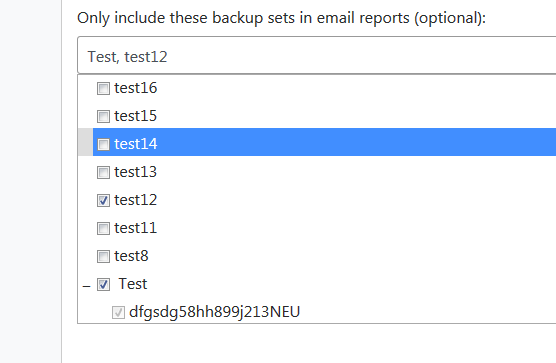 You can for example group your backup sets by department/customer and create one contact per department/customer that receives email reports only about this backup set group. Loving the email reporting its very helpful, but I do have one small request. Are we able to increase the contrast between a failed job and a successful job. I’m having trouble seeing the failed job in this screenshot. I’m slightly colour blind, but normally don’t have any trouble with green/red. TL:DR Are we able to make the red on a failed job a bit darker? Great work on this… I’ve used it for a while now and love it. @AndrewAUS: Thanks for this feedback. Making it darker may introduce new problems, as it decreases the contrast between text and background. This may not be a problem for you, but possibly other people out there… Also, there seem to be a lot of different forms of color-blindness looking at the simulators out there. To me, it seems hard to find colors that work well for all forms of color blindness and still look “nice” to “normal” people. Thus, I decided to highlight error and warning-cells with a dark border. This should be eye-catching for anyone, no matter whether colorblind or not. Does this work good for you? @mr-flibble Just noticed I have not replied to you, yet. Thanks for the idea, it truly makes lots of sense. I put it on our todo. 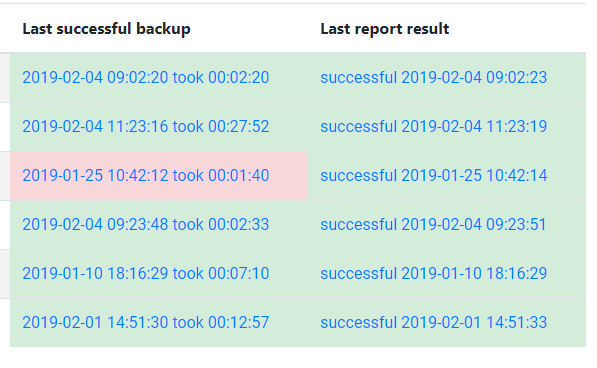 We currently receive about 7000 backup reports each day, so our database recently started growing a bit fast and the performance of the service suffered a bit form that. Its not like it is problematic, just that we need to think more about performance. That’s why we started to work on some performance improvements recently. As part of this, we archived the reports from 2017 and 2018. We have not decided yet whether we will make the archive accessible to you or remove it altogether. So a general question to our users: Are you just interested in the reports of about 3 months back, or would you prefer to keep all reports? Hello, it would be very convenient to be able download data (maybe as csv?) to analyze it locally. For example to see duration grow. My suggestion would be to run an database compress algorithm to aggregate the reports from the past. With aggregate I mean combine several reports to one by using average or max values for each field. The advantage is that the data base content would be reduced but without loosing information that can be used for displaying the graphs. As for the graphs the data needs to be combined never the less when displaying it over years. @oFeilner just noticed I did not reply yet. However, I read your suggestion and we consider it. Everybody feel free to comment on it. A big Thank you! to everybody who donated so far. Your donations really keep the service up and alive. I hope donations will soon reach a level at which we can afford to spend more time improving the service. It is now possible to change the number of rows displayed per page. I guess those of you who are monitoring hundreds of backup sets greatly appreciate that you can now select the number of rows per page. Don’t forget to donate, if our work saves you some time. Thanks to everybody donating, you keep this service running. We are now processing more than 8000 backup reports each day and are looking forward to see 1000 users registered soon. On the page for a backup set, there is now a chart that shows the backup durations. So you can easily see when backups are taking longer and longer over time. This had been proposed by @mr-flibble .Thanks for the proposal. The button to delete backup reports had been broken. We just fixed that. Appreciate your hard work! I’ve donated a couple times in the past and will donate again soon - I find it very valuable.